As the summer season enters it’s twilight I am excited to welcome in the Fall when we see school buses, falling leaves, the smell of baking and the dusk of early evenings. Honestly, the Fall is my favorite time of the year… the anticipation of what the season brings and the family we will share it with. “After the Harvest” is not only the second image I created in this fine art chapter of my life, but it is also the first image I created with two of my children aside from our yearly Christmas images we created when they were smaller. I love this image so much I have a private version hanging above our fireplace that includes all four of our children. One of the lessons I take away from the experience of creating this image is the youthfulness and joy we all share after our work is complete and the sense of accomplishment we get to revel in. 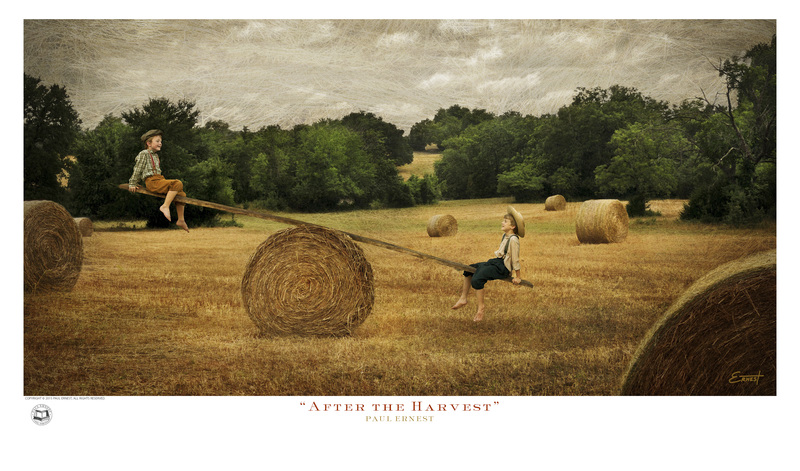 “After the Harvest” to me is the antithesis of our fast-pace culture and the daily ushering of our to-do lists and deadlines. What is your “harvest” in life… more importantly do you take time after the harvest and what are you doing with that time? If we don’t at least take time to ask the question, then we are certain not to invite time in after the harvest.